On the 5th of April, a Citizens’ Dialogue took place at the Cultural Center in Izabelin (near Warsaw). 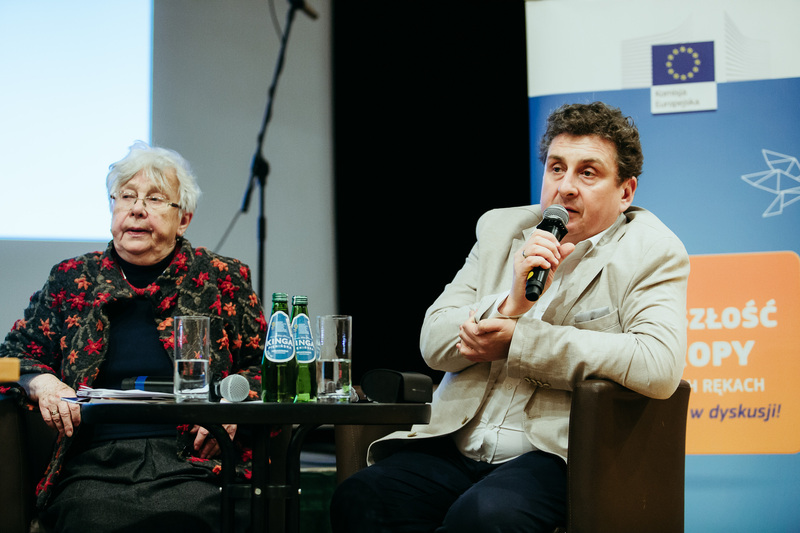 The following panellists took part in the dialogue: Mr Robert Sołtyk - European Commission, Directorate-General for Communication.. PhD Elżbieta Skotnicka – Illasiewicz -'My Citizens of the EU' Foundation, Team Europe. As a moderator : Mr Andrzej Godlewski – journalist and lecturer at the SWPS. This Dialogue was of special character because it was attended by three generations of residents and began to perform the Polish Hymn and Ode to Joy in the performance of the Izabelin choir. After such a lofty introduction, a discussion began with the inhabitants of Izabelin. The older generation is aware that the European Union means peace and improving the quality of life. Meanwhile, these arguments reach a smaller extent to young people who have been united Europe also expects activities in other spheres of life. Dr Elżbieta Skotnicka-Illasiewicz from the Foundation "We Citizens of the EU" pointed out that the main goal the founding fathers of the EU was to maintain peace on the Old Continent. Today, these EU achievements are being questioned, and various types of disinformation campaigns want to show Europe as a place of constant crisis. "Disinformation is an old military term, and the Internet has created only new opportunities in this area. Also for this reason, you will need to regulate this medium - as it is the case of the press, radio or television. It appeals even to Facebook itself. Regulations regarding the Internet will be one of the key tasks for the European Parliament in the new term", said Robert Sołtyk, who also assured that the EU has already taken steps against manipulation of information.